Electrical Generators have been remaining a great resource to overcome the need of electricity where we have energy crises and problems with national grid, but they are also a major cause of polluting environment and reducing your fossil fuels by burning tons of fuels on a daily basis. Pakistan has been facing energy crisis these past 12 years and regularly looking for a substitute to fill the gaps. So, Generators, UPS and Solar Energy are used in Pakistan to have flawless electricity. Despite of having a lot of Solar Energy being used in Pakistan, we are unable to bypass Generators to produce 100% green energy. There are three types of Solar system off-grid, grid-tie and hybrid systems. With the introduction of Net-metering in Pakistan on year 2015, a huge turnover has been seen from off-grid to hybrid and Grid tied solar systems. Emerging countries like Pakistan, where there are load shedding problems, we always need a backup for an uninterrupted electricity usage. However, it can be in the form of Diesel Gensets or may be in the shape of batteries. The basic working of on-grid hybrid solar system is to generate electricity from solar panels and then transfer it in to inverters. The main function of the inverters is to convert your DC source to AC because solar Panels gives you DC power. When DC power is converted into AC via Inverter it can either be utilized or can be feed back into grid. When we talk about residential usage, Solar might fulfill your energy requirements but on Industrial scale solar standalone is not enough to meet your needs because in industries massive machines are operational and producing business of millions in seconds for owners. Indeed, we cannot rely only on solar because of its unpredictability. It can change dramatically from 1000 KW to 200 KW in a few seconds. Which can cause damage to machines and loss in production for owners. As a matter of fact, in industry you always need to synchronize another source with your solar system. It can be your Grid or can be Diesel generators in case of unavailability of Grid. Another reason to sync Generator and go for other options is shortage of availability of land and roofs. Solar Panels also covers approximately 120 sqft to produce 1KW. So, for a 1MW load I would require 12000 sqft roof or land available. It has also been observed that a customer’s load requirement is way too high and space available for installing panels was not enough. 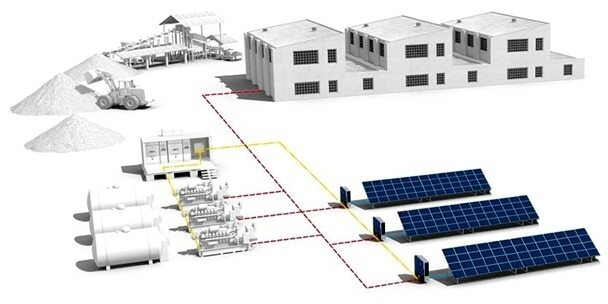 By Synchronizing Solar and Generators what it actually does? It shares its production from both Solar and Generators for Example your Load requirement is 1`MW and You have installed a 512kW solar Power plant and have 1.2 MVA Generator. So, if Solar is running at its peak and is providing you 400 kW the rest of 600 KW will be producing by Generators. Moreover, just in few minutes if the cloud came the production of solar will reduce from 400 KW to 200KW and now it will share more power from Generators. By synchronizing generators, we are not only getting uninterrupted electricity but saving our heavy machines, millions of rupees in production. Moreover, also reducing carbon and Fossil fuel burning because generators fuel consumption will also be low. Remember we should do proper designing of generators and solar system because poor designing will reduce generators life, damage to equipment can cause load instability as well. Do you live in an emerging country? Do you use solar energy and what do you think about electrical generators VS Soalr energy? Comment below. or copy this trackback: http://engineering.electrical-equipment.org/energy-efficiency-solar/electrical-generators-synchronization-why-important-for-solar-pakistan.html/trackback from your own site.